The Dollars & Sense: Digging into Local Food Opportunities webinar on April 27th proved to be a great opportunity to learn more about the significant new Dollars & Sense report. Report authors Dr. Atif Kubursi, Dr. Rod MacRae, and moderator Beth Hunter of the McConnell Foundation shared details about the report’s origin, and discussed the report’s findings, the extensive background research, and how this research might affect future directions for Ontario’s food system. Thank you again to the Metcalf Foundation, the Friends of the Greenbelt Foundation, and the J.W. McConnell Family Foundation for their generous sponsorship of this event. Learn more about the presenters. The webinar featured a lively discussion fueled by a questions from a wide range of academics, public health organizations, non-profits, foundations, and government representatives from municipalities and provincial ministries that joined us from across the country. Due to popular demand, we are planning a second webinar in June. Stay tuned for an upcoming announcement! The discussion gave attendees a deeper look into the report’s research on job creation, effects of organic transitions, emission calculations, the implications of trade agreements and more. Learn more in the webinar recording below, or the slide presentations at the bottom of the post. The Q & A starts at 42:25. [For new listeners, please note: the sound quality issue is fixed during the Q & A]. Webinar: Dollars & Sense: Digging into Local Food Opportunities from Sustain Ontario on Vimeo. Beth Hunter and Atif Kubursi’s presentations on the origins of the report and its methodology and findings. Rod MacRae’s presentation on the strategic implications of this research and how to harness its potential in practice. Watch the video to learn more about some of his upcoming research on food waste reduction! 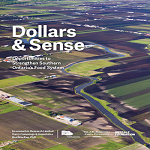 Download Dollars & Sense as well as background research from the Friends of the Greenbelt Foundation website: Dollars & Sense: Opportunities to Strengthen Southern Ontario’s Food System. Read Sustain Ontario’s summary: The Dollars and Sense of a Healthy, Ecological, Equitable and Financially Viable Food System. Learn more about the MaRS Solutions Lab: Ontario Tender Fruit Lab. Only the design brief is currently available; the report will be published to the MaRS website soon.